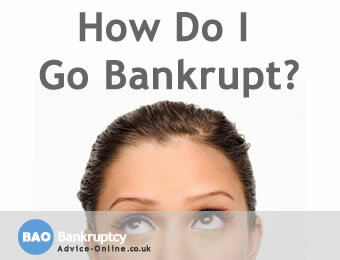 Wondering how to declare yourself bankrupt? Should I go bankrupt or not? Lots of questions are probably running through your head, but we have the answers to help with bankruptcy. This guide explains all the steps you will need to take to apply to go bankrupt. Step 1: Make sure going bankrupt is the right option for you. Step 2: Register for your online bankruptcy application. Step 3: Get the bankruptcy fee and deposit together. Step 4: Complete your bankruptcy application. Step 5: Submit your bankruptcy application online. Step 6: Pay the bankruptcy fees. Step 7: Receive email confirmation from Adjudicators office. Step 8: You are declared bankrupt. Bankruptcy can be an effective way to solve personal debt. BUT THERE ARE USUALLY OTHER, LESS SEVERE OPTIONS OPEN TO YOU, which need to be looked at if you need help with debt. Going bankrupt should ALWAYS be considered as a LAST RESORT. 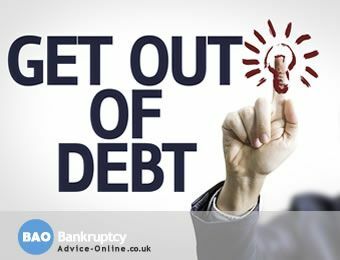 If you apply to go bankrupt the Bankruptcy Adjudicator will expect you to HAVE considered any bankruptcy alternatives and help with debt that you may qualify for. Even if you are sure bankruptcy is your best or even only option. Making yourself bankrupt is a big step to take and is huge decision to get wrong. We often get calls from people who regret submitting their bankruptcy application. It can be very costly to reverse the process once the application has been submitted. Make sure you get advice from a debt advisor. If you haven't already received advice from us and are considering how to go bankrupt, or are even asking yourself questions like 'should I go bankrupt or not? ', 'what will happen to my home? ', or 'will it effect my job?' you can use our online bankruptcy test tool. This quick check will give you with a free and confidential assessment of whether you qualify for bankruptcy, the impact it will have on your current situation, and show you any other options which may be available to you. Once you have checked that bankruptcy is the right option for you, you're ready to move to step 2 and start your application. To start to go bankrupt, you first need to create an online account. At the the moment the application may not work on some mobile phones. We suggest you use a laptop or desktop if possible. Once on the .Gov website you need to enter your name, email address and answers to three security questions you select from the dropdown menus. It's a good idea to write down the answers you've given to the security questions, as the online system will ask you one of your security questions each time you log into your application, and you won't be able to log in if you have forgotten the answer. Once you have entered the details you will get a message on screen confirming it has been received and that they will send you an email. Check your email to make sure you've got it, then keep this email safe as it contains your bankruptcy application number. The application number will look something like 7C4U-B3MB-EFFG you need this application number to logon to the system. If you and your partner are both going bankrupt, there is no such thing as a "joint bankruptcy" so you will each need to follow the process above to start a bankruptcy application. If you need help with bankruptcy then call our FREE Bankruptcy Helpline on 0800 368 8133 (freephone, including all mobiles). This might sound ridiculous, but applying to go bankrupt is not cheap. You have to pay the Official Receivers deposit of £550 and the £130 Adjudicators fee. So the total cost to go bankrupt is £680. Let one of our bankruptcy experts help you complete your bankruptcy application. It's FREE! The good news is that this can now be paid in bit by bit, the minimum you can pay is £5. You used to have to pay cash at court but now you can pay online using your card and the online bankruptcy fee payment system. This means you don't have to pay all you bankruptcy fees at one, you can pay a bit at a time, using the time it takes to save up the fees to enter all the details on the system. However you can not submit your application until the fees have been paid in full. You can also authorise someone else to pay your bankruptcy fees for you. We have a full guide on how much bankruptcy costs, it covers the help you can get with the fees, how you can pay and how the bankruptcy installment system works. If you are on a low income or get benefits, and your debts are less than £20,000 then you should check if you can get a debt relief order, as it only costs £90 to apply. You'll need to keep logging on to the system, using your bankruptcy application number. Once you have logged in, you start at the Application Overview page. This page shows you the status of each of the eight different sections and also how much of the bankruptcy fees you have paid so far. Please see the screenshot below which shows what the application page look like. Make sure you have all of the following before you start, as it will make the application far easier. If you have not got a complete list/proof of your debts. Don't panic. Just get a free credit report before doing this part of the application. This will list most of your debts and show how much you owe. It will not list all of your debts like Council tax debts or benefits overpayments. Until you are ready to submit your application you can go back and view the answers to the sections you have already done and edit them. Be careful when you are completing the income and expenditure section as, if it is found that there is surplus income, you could be face an Income Payments Agreement (IPA) for 36 months. The expenditure sections asks you to enter costs for alcohol, tobacco, entertainment, newspapers/magazines, social clubs and gifts – but these expenses will not be allowed in bankruptcy. So if you include any of these in your expenditure, they may be removed and it may be decided that you can afford to pay towards your debts under an Income Payments Agreement or IPA for short. So if you get your expenditure wrong or put more than is allowed in certain sections, you will be expected to pay monthly for 3 years. If you consider that an IPA of £200 per month will cost £7200 over the 3 years it will be in force. We recommend you speak to our advisors to help you make sure you are entering your expenditure in line with the official guidlines. We are very aware of the importance of the income and expenditure and know exactly what may be claimed and what can't. Please call the Bankruptcy Advice helpline on 0800 368 8133 (freephone, including all mobiles). Or click here and one of the team will call you back. You can also view our guide to the 8 sections of the bankruptcy application. This shows screen shots of each section and details you need to enter. Once you've completed all the questions in each one of the sections, you will see the screen below. Before you hit the "submit your application button", have a quick check through each section and make sure the information is correct and you haven't missed anything. Once you are happy that you have completed everything, and you have paid the £680 fee, you can submit your bankruptcy application. Why do they need all this information? This online application replaces the old paper bankruptcy petition form (Form 6.27) and the lengthy statement of affairs (Form 6.28). The information you enter, the credit check and ID verification enables the Bankruptcy Adjudicator to check that you qualify to go bankrupt. Once your bankruptcy application has been accepted, your information will be passed to the office receivers office, who will interview you about this. They will then go through your income and expenditure, taking account of any body who lives with you to see if an Income Payments Agreement or Income Payments Order is required. What if I can't answer all the questions? Don't panic! It's not uncommon for people not to remember everything about there finances, especially from 5 years ago. Many people who have debt problems have stopped opening letters. You may have moved house and lost some of your paperwork, separated from your partner, worked away from home or even lived abroad during the period the Adjudicator needs to know about. Just enter as much information as you can. If you are struggling completing the application, our bankruptcy experts can quickly help you with the application process. NEED HELP WITH THE BANKRUPTCY APPLICATION? Simply call the Bankruptcy Advice helpline on 0800 368 8133 (freephone, including all mobiles). Your bankruptcy application will not be accepted until you have paid the bankruptcy fee of £680 in full. When you have paid the fees and submitted your application, it gets sent to the Bankruptcy Adjudicator. They aim to deal with 95% of all bankruptcy applications within 2 working days. However it can take up to 28 days for them to make a decision. During this time you need to keep checking your emails, as they may want further information to process your application. Once they have made a decision whether they accept your bankruptcy, they will send you a confirmation email. You can also check the status of your application by logging on the the system. If your bankruptcy has been approved, there will be a copy of your bankruptcy order on the system, together with the date it started. Once a bankruptcy order is made, any bank or building society accounts you have will usually be frozen immediately for review by the official receiver. Your bank will then decide whether or not they will continue to allow you to bank with them. In the event that they don't you can arrange for an alternative bank account that will allow you to continue as usual. Once the Adjudicator has accepted your bankruptcy order and you have received your confirmation email, you’ll be officially bankrupt. If you have been made bankrupt your name, address and details will be published on the Insolvency Register. You can apply to have your address removed from the Individual Insolvency Register if publishing it will put you at risk of violence. This won’t affect your bankruptcy. You will also have to follow the bankruptcy restrictions. You’ll get a letter from the official receiver within 2 weeks of the Adjudicator making you bankrupt. The official receiver is an officer of the court who will manage your bankruptcy at this stage. You’ll also get an information pack that explains everything that you need to know and what you must do. 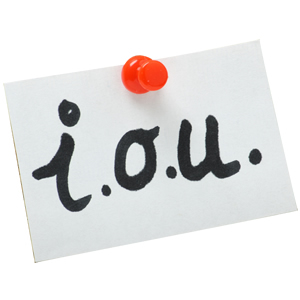 Read our guide to what happens at the official receiver to see what happens once you are bankrupt.